VIDEO: Thunder vs. Warriors Game 7 Full Highlights - 2016 NBA Western Conference Finals - Balita Boss! Down 1-3, the Golden State Warriors completed a comeback to win the best-of-seven series against the Oklahoma City Thunder, 4-3. The Warriors overcame a 13-point deficit to beat the Thunder in Game 7 of the 2016 NBA Western Conference Finals and advance to the NBA Finals for the second consecutive year. The three ball won it for Golden State. They outscored the Thunder by 30 points from the 3-point line. The defending champion opened the game 2-of-6 from three, then hit 12 of their next 24 — 10-of-20 in the second half, while the OKC went 7-27 from 3-point range. 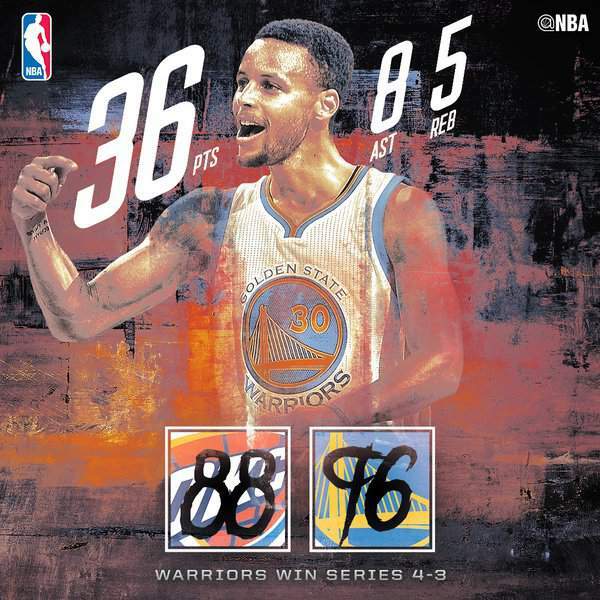 MVP Stephen Curry scored 36 points with seven 3-pointers to finish with an NBA-record 32 in a seven-game series, while Thompson added 21 points and drained sixth threes, two days after his record 11 3-pointers in Game 6. Durant scored 27 points to lead the Thunder. Russell Westbrook had 19 points on just 7-of-21 shooting, 13 assists and seven rebounds. Golden State will host Cleveland in Game 1 of the 2016 NBA Finals on Thursday (Friday in the Philippines).